Back in October, I read a thoughtful piece on fat shaming in the New York Times. It was too heartbreaking to simply include it in a weekly roundup: when I read it, I was so affected. A lot of people have mixed feelings about their weight and their bodies. I’ve written about my own; I’ve read novels about the theme. As a feminist, I’m particularly interested in pressure on women to be “attractive” (ie. the themes Susan Bordo writes about); it is deeply frustrating to me that so many women feel such pressure to be curvier or thinner or more hairless than they actually are. Our value should not be derived from our prettiness, yet in almost all parts of the world, it is. Women face harsher judgment than men, Dr. Puhl reports. The cutting remarks can begin when a woman’s body mass index is in the overweight range, while for men the shaming tends to start when they are obese. And women who are obese report more than three times as much shaming and discrimination as men of equal obesity. Like many people, when I gain weight – like this five pounds I’ve gained over the holidays – I blame myself. I should have eaten less or not had so much to drink. And that’s true. But lately I find myself reflecting on our culture. For people like me, who work desk jobs, 40-hours a week, 50 weeks a year, it can be hard to be active. Many jobs where you’re not sedentary pay less, which has its own health toll; and some well-paying positions that aren’t sedentary, like those in health care, require shift work that can be equally damaging. As a culture, we aren’t as supportive of regular exercise and healthy living as we could be. The problems with fat shaming start early. Rebecca Puhl, the deputy director of the University of Connecticut’s Rudd Center for Food Policy and Obesity, and her colleagues find that weight is the most common reason children are bullied in school. In one study, nearly 85 percent of adolescents reported seeing overweight classmates teased in gym class. Dr. Puhl and her colleagues asked fat kids who was doing the bullying. It turned out that it was not just friends and classmates but also teachers and — for more than a third of the bullied — parents. Can you imagine? Getting bullied by your own parents? Likely in their misguided attempt to prepare you for the world’s cruelty, but still. How awful! It’s true we want people to be “healthy”, and that carrying a lot of extra weight is damaging and causes stress on the body. But bullying is not a motivator, and the causes of obesity are not always simple. 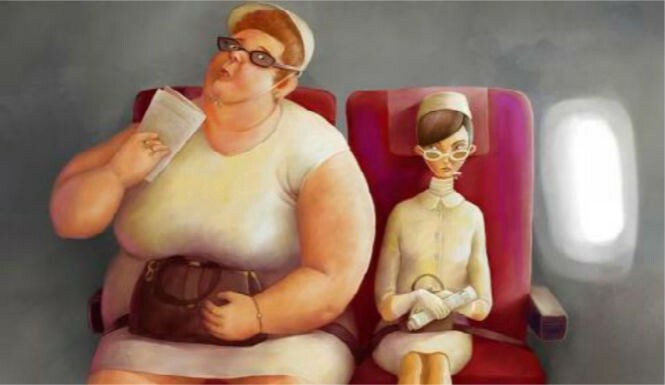 Anyway, it was well worth a read, as was this essay on airplane travel as a fat woman.